Over a thousand patrons at world famous Ritz Theatre in Elizabeth, NY were skanking to the rhythms of Reggae music this past Sunday, as Reggae icons Beres Hammond and Culture, and Roots Reggae phenomenon Tarrus Riley rocked the Ritz to its very core in celebration of Jamaica's 47th year of Independence. With a power-packed line-up that also included legendary saxophonist Dean Fraser, talented singer/songwriter Duane Stephenson, and former Digicel Rising Star siren Lenya Wilks, the year's staging of Reggae at the Ritz was a rousing kick-off to Jamaica's independence and emancipation celebrations in the Tri-State area. "For this year's Reggae at the Ritz show, we purposely chose Independence weekend," states popular New Jersey promoter Kasey "G City" Rankine, of RoadBlockRadio.com, who produced this year's event with Icon World Entertainment. "Reggae at the Ritz is all about showcasing the best of our culture-the best artists and entertainers that the Caribbean has to offer on the world-renowned Ritz Theatre stage. Beres Hammond, Tarrus Riley, Culture, Duane Stephenson, Dean Fraser and all of the artists that performed this year did a fantastic job of showcasing Jamaica's best." Duane Stephenson, most popularly known for co-writing the internationally acclaimed hit "True Reflections" for Reggae artist Jah Cure, set the tone for the evening with a flawless performance that included his singles "Ghetto Pain," "Dream Weaver," and his popular hit tune "From August Town." The evening then belonged to Tarrus Riley, who gave a powerful, soul-stirring performance that left the audience in a trance. From signature hits like "Beware" "Lion Paw" and "She's Royal" to his latest single, a masterful remake of the Michael Jackson classic "Human Nature" from his soon to be released album Contagious, Riley proved that despite his relatively young age and young career, he has the type of classical talent that can hold its own next to iconic acts like Hammond and Culture. Culture, led by Kenyatta Hill, gave an extraordinary performance, drawing from their 30+ year catalogue of Reggae staples like "Stop Fussing and Fighting" "Zion Gate" and "See Dem A Come." Hill gave a lively and energetic performance, channeling memories his father, the late Reggae icon and Culture lead singer Joseph Hill. "What a boy can sound like his father," exclaimed New Jersey resident Iris Peet. "That voice will live on." Lenya Wilks, who came in third in Jamaica's Digicel Rising Star competition in 2007, also performed flawlessly, paving a grand entrance for beloved Lover's Rock singer Beres Hammond. With a slew of lover's anthems dating back to the late 1970's, Hammond had the entire audience singing along to song after song, delivering a masterfully memorable set. "Tempted to Touch," "Rockaway," "I Feel Good," "What One Dance Can Do," "Can You Play Some More," are just a handful of classic and contemporary Reggae favorites that Hammond effortlessly belted out that had the audience reeling. "Beres is Beres--he's just classic," stated one concert goer who goes by the name Biggs. "You can never go wrong with a Beres concert. It's always worth it, every penny." "Reggae at the Ritz was a great way to celebrate Jamaica's 47th anniversary-these amazing performers really bring home the cultural impact of Jamaican music," states Frank of Icon World Entertainment. "Thanks to Ritz Theatre staff, and to STL Promotions for wonderful stage and production management, and all of our radio and media partners who worked with Icon World Entertainment and Road Block Radio to make this event a success." 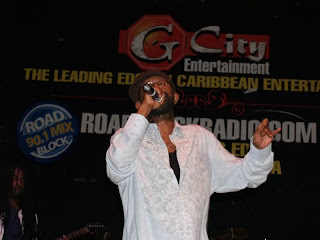 "We are looking forward to providing another great display of Caribbean talent at the 2009 New Jersey Reggae Festival on September 20th at the Bears & Eagles River Front Stadium in Newark, NJ," Rankine adds.